Marvel at the towering red rocks at The Garden of the Gods Park. Hike, bike, drive and explore the most beloved peak in the Rockies, Pikes’ Peak. Ski at a world-class ski resort and be home for dinner. Have fun year-round. That’s why! But hold on, our natural beauty is not the only reason. Colorado Springs also attracts students, professionals and military personnel to the area with a cache of military bases and nationally ranked colleges. Plus, construction in Colorado Springs is booming, with new residences popping up alongside quality schools, parks and cultural attractions. Whether you’re looking for outdoor thrills or educational and cultural activities, things to do in Colorado Springs are limitless making us the #1 Most Desirable Place to Live! 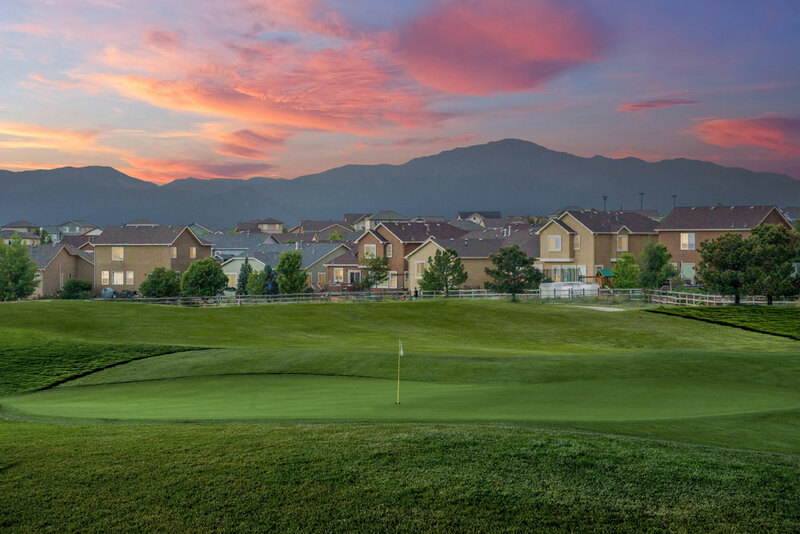 Start living your dream in Meridian Ranch, the best community in the Colorado Springs area! It’s time to start turning your daydreams into reality. At Meridian Ranch in northeast Colorado Springs, you’ll find a range of new homes to suit your desired recreational lifestyle. Meridian Ranch has a wealth of amenities, including a 42,000 square foot recreation center with a full array of activities, classes and fitness opportunities. Kids love the year-round indoor pool with water slide and interactive play features, while adults gravitate toward the leisure pool, lazy river and lap lanes. In the warmer months you can hang out at the heated outdoor pool with beach entry, slide and lap lanes. The multi-purpose courts accommodate basketball, pickleball, volleyball and much more. Enjoy a variety of fitness options, from free weights and cardio machines to group fitness classes and personal trainers. Prefer a little less structure, a little more nature? Play a round of golf at the Antler Creek Golf Course, the finest daily fee golf course in Colorado Springs and get over 8 miles of exercise. Don’t play golf? How about over 20 miles of trails, tons of open space and eight neighborhood parks to support your well-rounded lifestyle? Take a stroll or bike over to The Shops at Meridian Ranch, our community hangout, and enjoy an evening of fun and entertainment. Enjoy a nice leisurely walk home after dinner at Schafer’s Steakhouse at CreekView Grill inside Antler Creek Golf Course. Any way you look at it, living in Meridian Ranch is the easiest way to start turning your daydreams into reality. Meridian Ranch, the most desirable master planned community in the “The Most Desirable Place to Live”!